There was no better way to close out the inaugural WinterNationals then what transpired during the day in New Orleans. Superkarts! 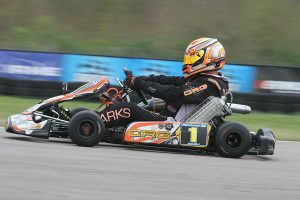 USA closed out the second round of the SKUSA Pro Tour on Sunday under cloudy skies, avoid the threat of rain all day. The action on track was hot, with the drivers putting in solid performances from the top level, down to the young Micros. Like the weekend, it was a day of firsts for a handful of drivers to wrap up the event. For complete coverage, head over to the EKN Event Page. Entering the weekend, it was tough to see the S1 Pro Stock Honda category at only 13 entries. That brought on the move to put them with the S2 division for a two-class/one race group for the entire weekend. While the number is lack luster, the quality of talent is phenomenal. The main event could be considered one of the wildest S1 Finals in Pro Tour history. It began with top qualifier and Prefinal winner Billy Musgrave (MRC / Aluminos) starting on the pole position. In a wild opening lap, Musgrave dropped to third behind defending champion Danny Formal (DRT / DR Kart) and S1 rookie Mathias Ramirez (Andersen / Birel ART). On lap two, contact with two-time SuperNationals winner Gary Carlton (LEM / Formula K) sent Musgrave around and to the tail of the field, out of the running. Ramirez was quicker early, taking the lead from Formal as a group of six drivers formed the lead pack including Saturday winner Jake French (DKC / Sodi Kart), AJ Myers (TB Kart) and eventually S1 rookie Hunter Pickett (Aluminos). After retiring early in the Prefinal, Carlton looked like a man on a mission, charging his way to the point and lead for five circuits. 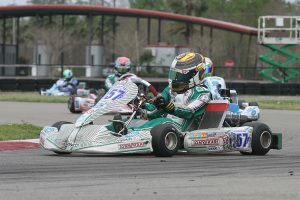 A slight wheel drop on the exit of turn 15 sent Carlton around, making hard contact with a stalled kart on the side of the track, ending his chance at a run for his first Pro Tour victory. Ramirez took back the lead, but behind him the eyes were on Pickett. Getting one driver at a time, he was putting the pressure on Ramirez and French late. With two laps remaining, French tried the inside of Ramirez and the rookie did not want to give up the spot. He washed up into the marbles, losing the lead and the front pack. Pickett took advantage, slipping past both to take the lead for the first time all weekend with Formal following through for second. Pickett ran the final lap clean, as Formal was unable to challenge for the top spot, and Pickett took home his first Pro Tour victory. Formal crossed the line second, but was removed from tech for an engine infraction. That promoted French to the second spot with Myers to third. Ramirez held on to end up fourth with two-time former champion Fritz Leesmann making it two Aluminos drivers inside the top-five. Following the SuperNationals, karting was not the primary focus for Zach Holden. Open wheel racing is the next move for the Indiana driver, but time on the scheduled allowed for a trip the WinterNationals. Holden (Comet Kart Sales / Tony Kart) was among the challengers Saturday, finishing seventh. Today, he qualifying 10th while placing sixth in the Prefinal. Christian Brooks (Nash / FA Kart) secured the pole position for the main event with top qualifier Ryan Norberg (PSL / Birel ART) slotted outside row one. Saturday winner Jake Craig – over came a lost chain in qualifying to finish third in the Prefinal – led the opening circuit before Brooks retook the position. Brooks led while Holden was knifing his way through the lead pack, taking over the top spot by lap 11. Next was Brandon Jarsocrak, as the KartSport North America / Praga driver fell to fifth, working his way into the lead by lap 18. Heading down the long straight, a slight error opened the door for Norberg to slip through. They both drifted wide and Holden took back the point. He would hold on through the final circuit, scoring his first Pro Tour Senior victory. Brooks was able to work into the second spot to put Jarsocrak back to third for a second straight day. Craig ended up fourth with Norberg back to fifth. A mechanical issue took a possible win away from Jamaican Collin Daley in the S2 Semi-Pro Stock Honda division. 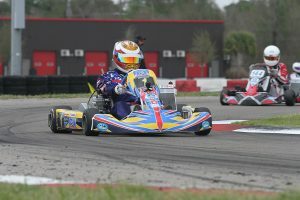 Today, Daley swept the action for his first SKUSA Pro Tour victory. Daley (DRT / DR Kart) was dominant in the Prefinal and was able to get away quickly in the main event. Saturday winner Riley Dickinson (DKC / Sodi Kart) never gave up, cutting into the early advantage Daley established. On the final circuit, Dickinson ran up to the bumper of Daley, just unable to make a move, settling for second to leave as the championship leader. 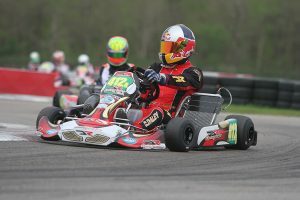 Graig Alvarez put another DKC / Sodi Kart on the podium for his best Pro Tour result. Canadian Gianfranco Mazzaferro (PSL / Birel ART) drove to fourth with Andretta Young (DKC / Sodi Kart) earning her best finish on the SKUSA Pro Tour. 2016 X30 Master champion Derek Wang was the driver to beat all weekend. A tech issue Saturday cost him a shot at the victory, however, it was clear sailing on Sunday to his first SKUSA Pro Tour victory. The BBR / FA Kart driver swept the action, never relinquishing the top spot and earned a perfect score on the day to help his championship hopes. Saturday winner Blake Choquer (BBR / PDB) was able to get away to finish in the second spot with Mario Barrios (PDB) making it an all BBR podium in third. Miguel Mier (DKC / Sodi Kart) improved to fourth with Travis Irving (Formula Works / CompKart) in fifth. Props to local driver John Robicheaux (Exprit) for advancing 11 spots to sixth with a bruised up body. Two rounds of racing on the weekend provides drivers to find that extra little bit to help put them at the top from one day to the next. Renato David did just that, sweeping the action Sunday for his first S4 Master Stock Honda victory. David set fast time in qualifying over Saturday winner Jordon Musser, however, was slow off the line for the start of the Prefinal. Musser led the majority of the race until David ran him down, taking the lead and the race win. Musser grabbed the holeshot to begin the main event, leading just three laps before Renato took back the position. Leading the rest of the way, David scored the victory by just over one second. Musser settled for second, including the fast lap honors, with Ryan Kinnear (Champion Racing / Intrepid) rounding out the podium. 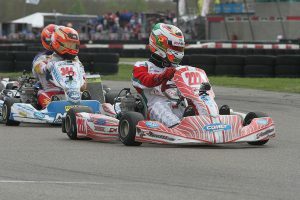 Ben Schermerhorn (Birel ART) and Victor Jimenez (RPG / Tony Kart) finished fourth and fifth. Robert Marks made it look easy in the S4 Super Master Stock Honda division, driving away to a dominating win Sunday. Mike Jones (DKC / Sodi Kart) set fast time in qualifying but lost the lead in the Prefinal to Marks (PKS / CRG) as the Saturday winner led all but one lap for the Prefinal win. Jones stalled on the line to begin the Final, and had to knife his way through the field. This left Marks alone out front, running away to a 2.298-second advantage at the checkered flag. Jones worked up to the runner-up spot ahead of Nick Firestone (DRT / DR Kart), Willy Musgrave (MRC / DR Kart) and John Crow (MRC / Praga). It was a hard fought battle to the very end in the X30 Junior category. Aidan Keel (Andersen / Birel ART) and Dylan Tavella (Iron Rock Motorsports / Tony Kart) were the early contenders on the day, with Keel setting fast time in qualifying and Tavella working to the front of the field in the Prefinal. Tavella paced the field for much of the main event, leading the first 14 of 15 laps. That was until Jak Crawford (Nash Motorsportz / FA Kart) worked his way past with three laps remaining. Tyler Gonzalez (SRC / Tony Kart) followed him through to drop Tavella to third. It was a wild last lap with Gonzalez able to work past Crawford in turn 8. Heading into the final corner, Gonzalez left a little bit of room for Tavella to try and sneak inside. The two exited the corner side by side, and the rest of the top five scattered to for room to drag race to the checkered flag. At the line, Gonzalez took the victory by 35 thousandths of a second over Tavella. Keel crossed the line in third – back by 91 thousandths – but was penalized one position for contact to move Crawford up to third. Pedro Lopes (RPG / Kosmic) rounded out the top five. The Cadet divisions joined in with wild finishes of the their own. It was anyone’s main event in the Mini Swift category. Santiago Trisini (Benik) posted fast time in qualifying and won the Prefinal to remain on the pole position for the main event. He led early but was joined by a host of drivers, combining for roughly seven lead changes of the 17 laps. Brent Crews (Nitro Kart), Carson Morgan (Benik), Reece Gold (Benik) all took a turn at the point. On the final lap, Gold was leading with Trisini second and Saturday winner Luca Mars (Energy) third. Gold took the lead from Trisini with Mars following through, only to slip past Gold to take the lead. Not close enough in the final corners, Gold could only watch as Mars drove to the checkered flag first to complete the double win weekend. Gold crossed the line just ahead of Morgan to complete the podium. Rounding out the top-five was Trisini and Crews. Brandon Carr (Benik) appeared to be the major threat again in the Micro Swift division as the Saturday winner came through with the Prefinal victory. Elliot Cox (Vemme) had other plans. The lead pack was four with Frankie Iadevaia (Nitro Kart) getting away early but reeled back in by Carr, Cox and top qualifier Alex Powell (Tony Kart). Carr led the majority of the Final until two laps remaining when Cox took over the point. He held a defensive line into turn one, allowing Carr to slip past on the exit. The draft help Cox get back alongside Carr at the end of the straight, setting up for a pass at turn three. Cox came out of the corner strong, establishing a gap ahead of Carr as Iadevaia slipped past for second. Unchallenged to the checkered flag, Cox took home the victory. 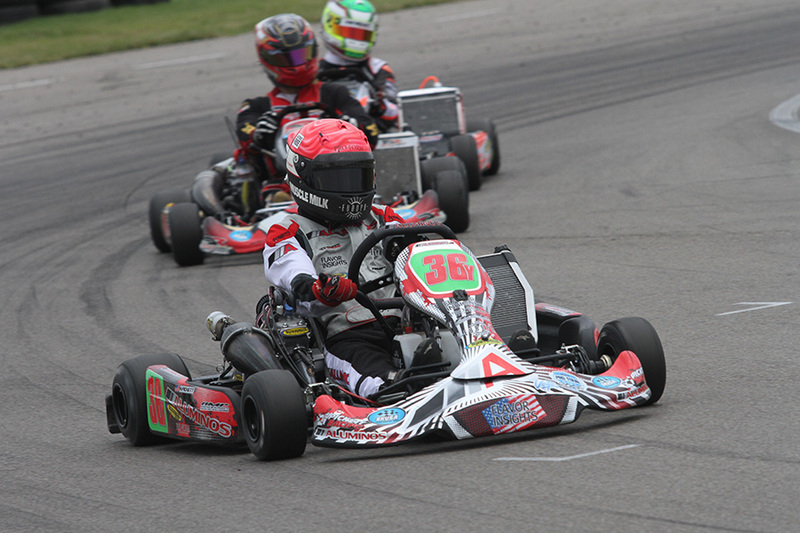 Iadevaia gave Nitro Kart its first SKUSA Pro Tour podium with Powell slipping past for third. A one position penalty for contact dropped Powell to fourth, moving Carr back to third. The fight for fifth went down to the wire with Caleb Gafrarar (Parolin) earning the position.